Single Line Progressive Type Lubrication System that we offer is manufactured using the latest techniques under the guidance of experts. It is subjected to stringent quality tests so as to ensure its defect-free working. We are one of the eminent Manufacturers and Suppliers of Lubrication System. 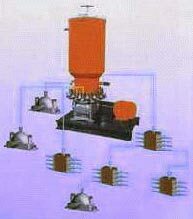 One can obtain Lubrication System from us in small as well as bulk quantities at the most reasonable prices. Principle of operation : Entire output of the pump is supplied to the bearing points through a distributor/metering device irrespective of varying pipe lines or bearing back pressures. It consists of hydraulics/pneumatic/manual or motorized pump with a single line to the metering device and then to further metering devices or directly to the bearings. There is no return line hence this system can be TOTAL LOSS or can be RECIRCULATING type lubricating system. This system is very flexible with various types of pumps and progressive distributors up to 576 points. When a motor is started, pump delivers the lubricant under pressure to the distributor from where it is either deliverd to the next distributor in case of large number of points or directly to the bearings. Pecularity of this system is that, unless metered quantity of lubricant is delivered from one particular outlet of distributor, lubricant can’t be delivered from next outlet. This sequential operation makes the system SELF MONITORING type. Thus monitoring of a single outlet is as good as monitoring whole system. Presses, Packing Machines, SPMs, Textile Machies, Crushers, Construction Machines and Plastic Processing Machines.